July was a bad month for gear. Just over a month ago, I posted about my “Old Faithful” tent and camping grill. Shortly thereafter, in fact, just a handful of days later, my tent and grill were laid to rest, without (much) fanfare, in the campground dumpster at The Beach Camping Area in North Conway, NH. Wooden cross and prayer service provided tent-side by Mrs. “The Machine”. We were up there camping for a long weekend with my family, as well as my friend’s family, and our first camping trip with our dog, Sasha. It rained all weekend, but only after camp was setup, and dinner was served, both nights,m and the days were clear allowing for fun filled family days at places like Storyland and Clark’s Trading Post – both of which the kids loved. Also, much time was spent on the beach next to our campsites. The first night, the zipper had catastrophically failed on the tent… ripping not just the nylon zipper parts, but, also through the worn and weary tent. On the second night, Sasha, our dog, jumped through the mesh of the door. Along with a few other rips and tears… Old Faithful was done for. That wasn’t all… my old Winston camping grill had also failed. Luckily, despite the very wet conditions, we had a fire going the entire time, so cooking was not a problem, everything was just a little more cooked than usual. Before dumping the tent and grill into the dumpster, Mrs. “The Machine” said a few words, and made a cross out of sticks. I also cut off the door with the Marlboro emblem, and am saving that as a keepsake. But was that all? No…. 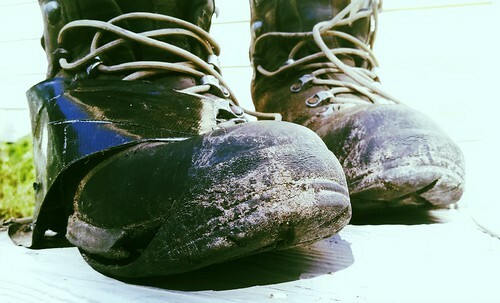 After several repairs using Gorilla Glue and Shoe Goo, both soles of the boots were completely blown out, and were both held on during the descent of Mt. Osceola by duct tape. And not only the treads, so they could be re-treaded, but the entire soles. So, I am in the market for a new 2 person dome tent, camping grill, and backpacking boots. 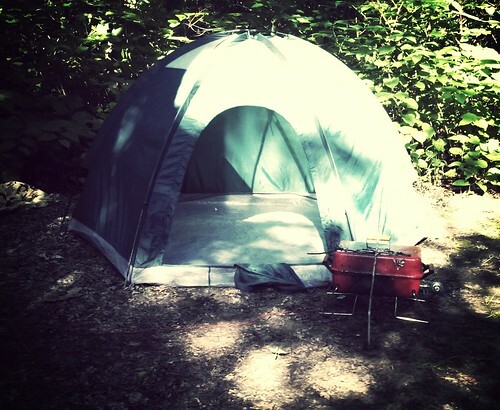 The tent is not as important (except for the memories), , as I have my 1-person Eureka! Solitare tent, and my hammock system I am building up for my backpacking trip planned for September (lots of posts to come on that! ), as well as my 6-person family tent. The grill is an easy replacement (again, memories), as it is just a cheap-o $30 propane grill. The boots, however, need to be replaced ASAP, as I came to the realization that I don’t have any backups, except for some 16-year-old Merrill’s, which, when I dug them up from the basement yesterday, were a tad on the moldy side. Apparently they got a bit damp! This entry was posted in Backpacking, Camping, Gear, General Nonsense, Hiking and tagged Backpacking, boot, boots, camp, camping, equipment, gear, grill, grilling, hammock, hammock system, retired gear, tent. Bookmark the permalink. It’s sad to see old pieces of kit fall apart. But sometimes it can provide a good opportunity for some upgrades! Indeed, it is a sad day when gear fails, but you are exactly right, some great upgrades are planned!